The Malaysian Automotive Association has forecast total vehicle sales in Malaysia will be 615,000 units in 2012, up 2.5% over 2011. If this figure is reached it will be a record for Asia’s largest passenger car market. This bullish forecast for 2012 is despite the fact that vehicle sales in Q1/2012 dipped 12.6% to 138,544 units from 158,432 units in Q1/2011. Various reasons have been put forward to explain the drop in Q1 including the Lunar New Year and new credit policies. I was under the impression the Lunar New Year was an annual event and always in the first quarter so I don’t know how that would be a problem this year. Personally, I think the main reason for the Q1 drop is that the global economic situation is having an impact on the number of loans approved by local banks wary of a repeat of the Asian financial crisis of 1998. Whatever the reasons, it is good to see that BMW is doing what it can to sell its new six series with an extensive digital campaign. 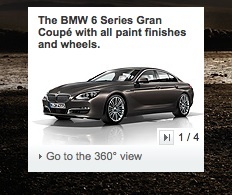 I clicked on the link and was pleased to learn that the Bavarian giant will be offering wheels with the new 4 door coupe. This should help increase sales for 2012.